CEN Radisson Ecological Research Station (Station de recherche écologique de Radisson). The station is the property of the Radisson municipality. It is run and operated by the following three member institutions of the Centre d’études Nordiques (CEN: Centre for Northern Studies): Université Laval, Université du Québec à Rimouski and Centre Eau, Terre et Environnement of the Institut national de la recherche scientifique. The station has a long-term lease with the municipality. The CEN secretariat based at Université Laval oversees the management of the station. This station is part of the CEN Network, more precisely the Qaujisarvik Network of stations, and is the most southerly station of the network at 53°N. The vast expanse of the Québec territory, adjacent to James Bay, is administered by the Société d’énergie de la Baie James which is a subsidiary of Hydro Québec. Hydro Québec is responsible for emergency services and requires an annual logistical and security plan for all visitors. The station is in the centre of the village of Radisson (53°47’29’’ N, 77°37’37’’ W), a small village of approximately 350 inhabitants situated on the margins of the Robert-Bourassa hydroelectric dam (LG2), which is part of the La Grande River hydroelectric complex. Radisson is surrounded by the eastern Canadian Shield taigaBoreal forest, a nearly continuous belt of coniferous trees across North America and Eurasia. Taiga is dense forest with many fallen trees and marshy soil. The term derives form the southern Siberian Turkic-Mongol... More with BorealNorthern, from Boreas, the Greek god of the north wind.... More forest that is dominated by black spruce and grey pine. The region is relatively poor in terms of plant species diversity with a count of about 350 vascular plant species, yet the diversity in wildlife is rich with forty mammal and sixty bird species. Forest fires are a very dynamic element of the region, sculpting the landscape into natural mosaics nested between rocky hills which confine the lower wetlands (mainly lakes and bogs). Radisson is situated in a postglacial marine invasion with limited drainage due to the presence of clay in the lowlands.From 1989 to 1996, fires within the town of Radisson considerably changed the landscape. The region has been studied and monitored extensively since 1974 in the context of the development of the hydroelectric complex. Consequently, Hydro-Québec and the Société d’énergie de la baie de James have produced several syntheses on the area. Researchers from the CEN have been working in this region since 1994, but the station was established in 1999 and was upgraded in 2010. The facility consists of three houses (3 bedrooms each), with a total capacity for 25 people, a laboratory building with a chemical hut, a meeting room, and a workshop. Past research has focused on regional ecosystem dynamics, specifically on the response of the forest to disturbances such as fire and insect outbreaks, dendrochronology, riparian vegetation, snow, secular variations in water levels, hydrology, climate and reservoirs, greenhouse gas emission by reservoirs, and limnology. Research topics have covered issues on wildlife (birds, caribou, small mammals, and fish) and vegetation (biodiversity). CEN operates three climate stations in the area, one of which is near the town, another is in the centre of the LG2 reservoir, and a third is approximately 350 km inland on an island of the LaForge 1 reservoir. 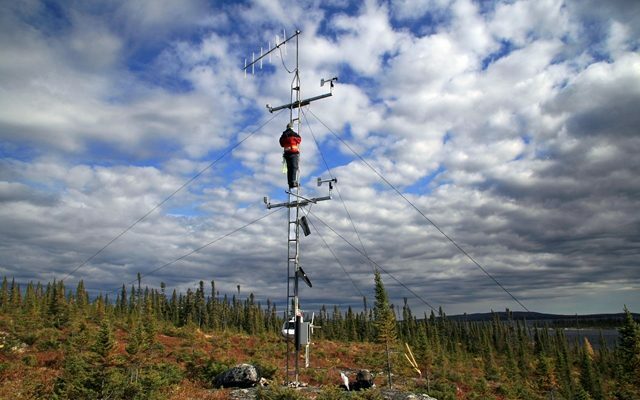 Besides scientific literature, CEN has also collected extensive climate datasets since 1996, which is available at: www.cen.ulaval.ca/nordicanad or upon request (cen@cen.ulaval.ca). The town of Radisson is located on the south shore of the La Grande River which drains the water from the La Grande hydroelectric complex. It is the most northern French speaking community of Québec. It is also the only non-aboriginal community north of 53°N. Despite its remoteness, Radisson offers a wide array of services: i.e. gas station, hardware and grocery store, and a small hotel. Radisson is accessible by road. From Matagami, the James Bay route covers over 624 km. This route provides access to several Cree villages and trans-taiga ecosystems which border the hydroelectric reservoirs. It is a private road requiring user registration at the entry gate for security reasons. Contact CEN for more information (cen@cen.ulaval.ca).